Don’t you love those spring/summer mornings when you wake to a cloudless sky, bright sunshine and perhaps the singing of birds. Even better if it’s your day off! You consider bringing out your milder weather clothes, as the ones you have been wearing are sure to be feeling ever so slightly warm. As you wait for the coffee to heat, you open the back door and step out into the garden. It’s only then that you realise it isn’t as summery as it looks, and there is still a definite nip in the air. Maybe that breeze is just a touch too intense, making you pull your robe tighter and step back into the kitchen. You will view the garden from the safe confines of the window for now. Even when summer has unmistakably arrived, there are times when you cannot comfortably enjoy the outdoors. You know, those lovely warm days when you put a foot outside the door only to feel drops of rain before you scuttle back inside. 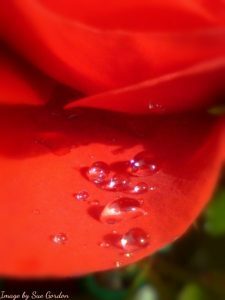 Rain droplets on rose petals are beautiful, but not while you are getting drenched. But there is a simple solution to these times when disappointment threatens, and one which means you and the rest of the family can enjoy the full benefit of the garden, yard or outdoor area. A veranda or glazed canopy will give just the right amount of shade or shelter you desire all year round, depending on its design. Even the simplest structure fashioned to give a modicum of weather protection will provide a solution to wanting fresh air without feeling too exposed or getting wet. Verandas, glazed canopies and smoking shelters are the answer for this type of problem, and can significantly raise the profile of your property. A bespoke installation from TWS Shelters and Verandas, blends superb quality craftsmanship with high performance materials for a satisfactory, long lasting result. Browse the website for lots of information about verandas, glazed canopies and smoking shelters.